So I noticed there was no thread yet about this page and decided to start one. I put it under marginalia because, based on what I have read online, there seems to be a consensus that whatever is going on in this folio is distinct from the rest of the text/language, and possibly added later. I also wanted to start this thread because I found something which I believe may be of interest while looking through manuscripts from the online collection over at the Munich Bayerische Staatsbibliothek. It's not a match but those first two words definitely caught my attention... Von (or Con with a K?) labor... The text seems to be some kind of mix languages, and has something to do with "hearing the singing words"... I can't really make it out beyond that. I know that such charms or spells with crosses are common but it seems to me the text of this one might provide a clue about that first line on f116v. Hope this page sees more comparisons too! Last year I wrote a You are not allowed to view links. Register or Login to view. about line 0 of f116v. I think that it is not related to lines 1-3 - basically, because it starts (as I argue) with "pox leber", which is a typical obscene expression from the German medieval carnival culture. 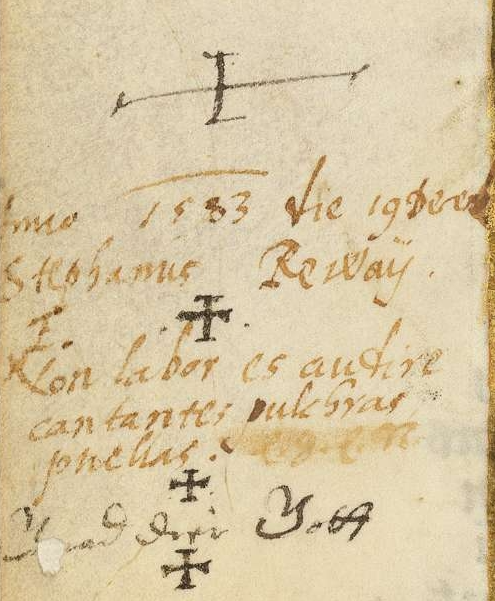 A short obit for Stephanus Reway, singer, who died 19th (something I can't make out, it's not quite gener (for January)) 1583 which means the crosses might be signs of the cross (genuflection). I can't make out the second-last line (something about polishing brass candles?). I think that might be INRI in the middle of the last line (in lowercase), but I'm not sure. JKP- Thanks for clearing up that it is an obituary, that hadn't occurred to me at all. Are you sure about the singer though? I find a trace for Stephanus Reway, ruler (voivod) of Madaras, Hungary in the 16thC. The "brass candles" bit is what I identify as "audire cantantes palabras" or "hear/ing singing words". Maybe a way of saying: hearing the praises for the work of Stephanus Reway? Anton- Hah! I love the idea that it is an expletive. Maybe a later owner who said: Pox leber, I can't understand a word of this damned cipher text! Where it it says, "Von/Con? labor es antire/autire? cantante," I deconstructed that as possibly meaning, "With labor (profession) is/being [antire] singer." I have no idea what antire/autire? means. Antire sounds like "anterior" (back, behind) but may mean something entirely different. But if it's in any way related to anterior, it could be like "back singer" (like a choir singer or anyone who is part of a chorus rather than the soloist). But... if it's a "d" (which it probably is, since the "tees" are small), then songwriter rather than back singer. "Pulchras" might be "beautiful" or if it says "pulebra" rather than "pulchras" that would be "excellent". I can't make out the meaning of "phehas/phebus" other than it might be a name or... perhaps it's two words "phe" and "has"? So... that comes out to, "The work/effort was authoring beautiful/excellent songs phe has?." or if it's "con" rather than "von"... "With some effort, you can create/listen-to beautiful/excellent songs?" And... it could be something entirely different. I don't know Spanish (especially old Spanish), I can only get the gist of it, but that was my reasoning. Someone who knows Middle Spanish might be able to translate it. I wonder if the date should be 19 December. On the 'pox leber': this is recorded as a swear word in the work of one particular author (Hans Sachs) but should just mean billy goat liver in most cases. (01-03-2016, 06:26 AM)ReneZ Wrote: You are not allowed to view links. Register or Login to view. pulchras puellas? Speaking of "Pox leber/leben", I haven't seen anyone suggest that "pox" might mean the same thing it means in the rest of the VMS. This word-token appears at the beginnings of paragraphs. (01-03-2016, 06:26 AM)ReneZ Wrote: You are not allowed to view links. Register or Login to view. On the 'pox leber': this is recorded as a swear word in the work of one particular author (Hans Sachs) but should just mean billy goat liver in most cases. "Pox something" is recorded many a time in Fastnachtsspielen, please see G. Schwerhoff's thesis, section 4.1.4, for details (I referred to it in my blogpost cited above). It reads your work was that of a singer author ( autor cantante) - nowadays it would be a cantautor. A person who composed their own songs to sing.